How to follow-up for finalizing new clients? Finalizing new client is one of the difficult thing for a franchise company. It needs a lot of follow-up and concentration to finalize the deal. A single query may have more than five companies price list and offer. It makes deal more complex and tough. But with proper follow-up and satisfaction, you may close the deal. Query generation is an easy process while convert them into sale is difficult. More difficult is to distinguish interested queries from fake queries. In modern ways of marketing in pcd/franchise companies, there is maximum chances of fake queries from online business portals. Percentage of fake queries depend at portal you use. Promoting your own website and get queries from it is best way to get convertible queries. Main problem that are faced during follow-up is that executives generally forget to collect data of queries that may be interested in their company. Executives spent more time to make follow-up to fake queries rather than interested one. 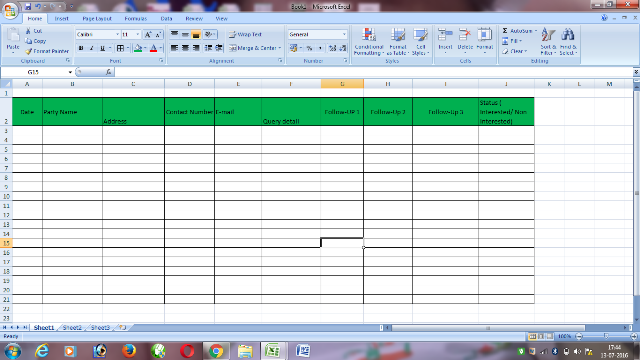 If you receive 3-4 queries daily, you have to prepare a excel sheet containing all detail of query you received. Here we are going to provide easy way to collect all data and take proper follow-ups. 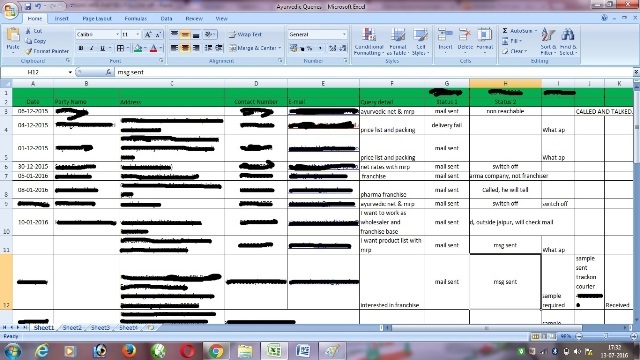 Prepare an Excel sheet like we shown in snap shots. It’s an easy and effective way for proper follow-up. You have to add queries at regular basis and delete non-interested queries from it. You should save all queries at a particular place for future purpose but in this list, update regularly all queries and their status. We are supposing, you receive 3-4 query daily. Note down or copy these queries into this sheet. Same day talk to each one. You can get positive or negative response in first call. Note down it in status column. Interested one may ask for price list or sample etc. Some fake queries will do the same by asking detail but after two to three follow-ups, you can get exact status of query. Don’t waste time at non interested queries and delete them. Send price/product list to interested queries. Send samples also which one ask for it. Update it in status column. Every status should be updated in your sheet. Regular follow-up doesn’t mean, you will irritate your query. Respect person’s privacy. Don’t be spammy and leave query for certain period of time. Wait for his response, if he will interested, he will definitely revert to you. Otherwise call him for final time and delete the query. Concentrate at new one.